If you're looking for a trending international destination for your next getaway, consider Tbilisi, Georgia. According to Conde Nast Traveler, Tbilisi was one of the best places to visit in 2018. The city lies on the banks of the Kura River, at the crossroads of Europe and Asia. Tbilisi is full of historic architecture, museums, theaters and universities, along with sports enthusiasts, a growing nightlife and a delectable food scene. It's more doable than you think. According to travel site Skyscanner, there are plenty of flights from San Jose to Tbilisi in the next few months, and the prices aren't too shabby. The cheapest flights between San Jose and Tbilisi are if you leave on March 22 and return from Georgia on April 1. Alaska Airlines currently has roundtrip, nonstop tickets for $853. There are also deals to be had in January. If you fly out of San Jose on Jan. 19 and return from Tbilisi on Feb. 2, Southwest Airlines can get you there and back for $882 roundtrip. To plan your accommodations, here are a couple of Tbilisi's top-rated hotels, that we selected from Skyscanner's listings based on price and customer satisfaction. If you're looking to treat yourself, consider The Radisson Blu Iveria Hotel, Tbilisi. The hotel has a 4.5-star rating on Skyscanner, and rooms are currently available for $239. Set in the heart of Tbilisi, this hotel is close to the Tbilisi Opera and Ballet Theatre and Kashveti Church. If you're looking to treat yourself, try The Tbilisi Marriott Hotel, which has rooms for $250/night. This hotel is also located near the Kashveti Church, the Tbilisi Opera and Ballet Theatre and Freedom Square. If you're looking for a popular spot to grab a bite, Tbilisi has plenty of excellent eateries to choose from. Here are two from Skyscanner's listings to help you get started. If you're looking for a local favorite, head to Machakhela, which has an average of 4.7 stars out of 19 reviews on Skyscanner. "This was our first attempt with Georgian food and it was exquisite," wrote visitor Mitchell. Don't forget the essentials: where to get your coffee fix. For a popular option, check out Coffeesta, with 4.4 stars from five reviews. "The coffee here is great, but what I really love is the location right on Rustaveli Avenue," wrote reviewer Robert. "Try to grab a seat outside if you can, and enjoy the amazing people watching!" 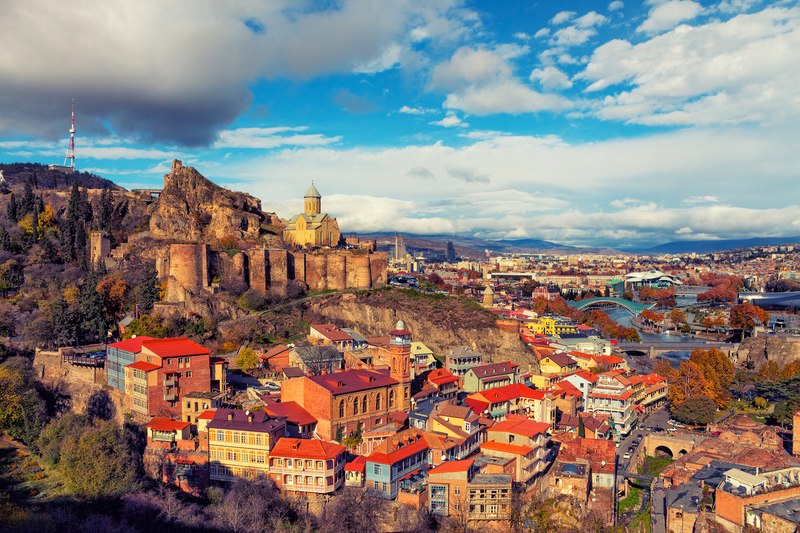 Tbilisi is also full of sites to visit and explore. Here are some popular attractions to round out your trip, again from Skyscanner's listings. The top-rated visitor attraction in Tbilisi, according to Skyscanner, is the Clock Tower. "This unique structure near the entrance of Tbilisi's old city sets the tone for the artsy and cute little world of the city's Old Town," wrote visitor Jenny. "It's more of a leaning tower ... and a steel beam seems to hold it in place. There are cafes and restaurants around the tower so get a seat on a patio and enjoy the view." "A wonderfully preserved ancient fort," wrote visitor Maria. "There are many spots with a beautiful view and if you like to get the best photos, go either to the middle of the bridge or climb into the tower." Lastly, consider checking out the Botanical Garden. "Small but pretty botanical garden in the heart of Old Town," wrote visitor Maria. "You can access it either from the upper cable car station or from a street near the old mosque."